In late April of this year, the federal government announced it would make sweeping cuts to the Interim Federal Health Program – a program that provides access to healthcare for refugees in Canada. 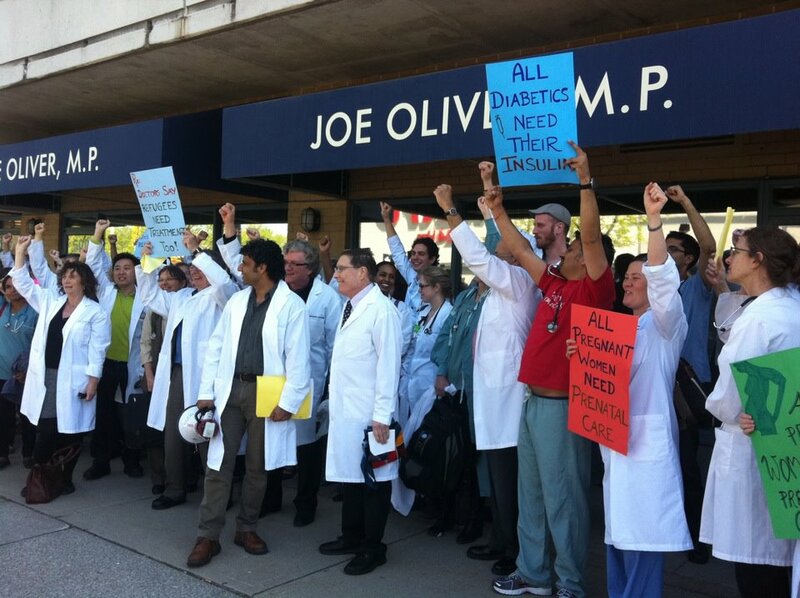 On May 11th over 90 doctors occupied Member of Parliament Joe Oliveri’s office, demanding the cuts be reversed. In June, rallies took place in 14 cities across the country. Frustrated by being seemingly ignored by the federal government, and having exhausted other means of communicating with Members of Parliament, physicians began disrupting news conferences. In response to this unprecedented mobilization of the health sector, the federal government quietly backtracked on some of the cuts. Refugee claimants no longer have access to medications, despite the fact that they often arrive in Canada with little more than the clothes on their back. A diabetic refugee claimant arriving in Canada with little or no resources will not have access to life-saving insulin he or she may need, for example. Furthermore, refugee claimants from countries deemed “safe” — those countries which the government believes are unlikely to produce refugees — will have no preventative care and no access to meds unless it is deemed a threat to public safety. Today, activist and pediatrician Dr. Samir Shaheen-Hussein returns to the show to talk with us about whether the cuts could have been predicted, their ideological underpinning, this summer’s mobilizations, and the “We Refuse to Cooperate,” campaign. Find out about the launch of “We refuse to Cooperate” in Hamilton (Sept 29, 1-4 pm @ Bayfront park) and the new org, Hamiltonians for Migrant and Refugee Health here. This entry was posted in activism, Canadian healthcare, migrant health, Uncategorized. Bookmark the permalink. Join HJRC for the 2013 Homelessness Marathon — Live!